Post your free kids chore chart on the refrigerator to help remind Mom or Dad every day that you want to make their lives easier. You can use the kids chore chart that's already filled out with common kid chores like Put Away Toys, Feed Pet, and Clean Room; or you can use the blank version to write in your own household cleaning tasks. If assigning chores is new in your family, it’s OK to begin with just one and grow your list over time! Not sure which chores are appropriate for your young kids? 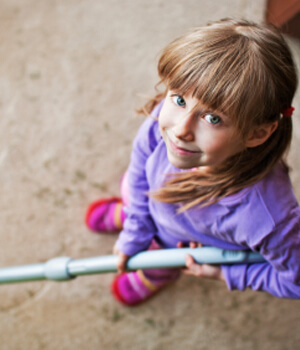 Use Molly Maid's Age-Appropriate Chores List to help you as they grow! For toddlers, chores like putting away toys, and putting books and magazines into a pile are a great start. As your children grow, chores that require more enhanced motor skills and cognitive abilities are added to the list like sorting laundry and sweeping the floor. For more tips, visit our blog!